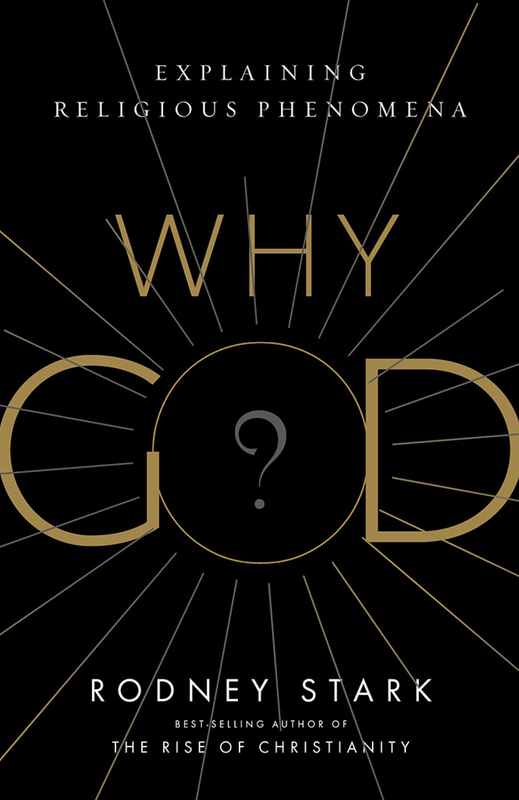 ISR co-director Rodney Stark has recently written Why God? : Explaining Religious Phenomena (Templeton Press, $24.95). In this interview with RW, Stark discusses, among other things, why sociological theory dealing with religion needs to take into account people’s belief and images of God and the importance of history in understanding religious change. RW: You state in the book’s introduction that Why God? is your third effort in writing a work on theory. Why did you feel it is important to do that now? Stark: I returned to theorizing about what religion is, what it does, and why it seems to be a universal feature of human societies because I know more now than I did in 1999 when I wrote Acts of Faith and because I finally felt able to extend my theorizing to include such things as miracles and revelations as well as religious conflict and civility. RW: You stress the role of belief in a supernatural God in creating religious vitality throughout the book. Can you explain its importance in your work? Stark: From the very start I have limited my definition of religion to systems of thought based on the existence of conscious supernatural beings—gods—despite the fact that most sociologists, especially back then, went along with Durkheim and accepted the notion of godless religions. That is, the prevailing view was that all systems of thought about the existence of life were religions, even those that denied the existence of gods. It seemed to me obvious that it was silly to be unable to distinguish the village priest from the village atheist. And I think even my earliest theorizing was far more powerful because I did limit my definition to godly systems of thought. RW: The role of emotion in religious ritual has been something else for which you have gained a new appreciation. Can you explain that? Stark: One loses a great deal if one fails to recognize the emotional aspects of, say, people’s prayer lives or what many people feel during such things as communion. People don’t just pray to get stuff; for many people prayer is a conversation with a friend. RW: The media and many scholars see the growth of the non-affiliated as the major trend in American religion. Yet your theory views the “nones,” and even secular Europeans, as being candidates for re-joining religious groups, even new religious movements. Stark: Certainly Richard Dawkins qualifies as one of the most famous and “intellectual” of the “nones”—the title of his book The God Delusion would seem to say it all. And yet at the end of the book, he wrote, “Whether we ever get to know them or not, there are probably alien civilizations that are superhuman, to the point of being god-like in ways that exceed anything a theologian could possibly imagine.” Indeed, it is self-styled atheists, not religious believers, who are the most likely to believe in UFOs, ghosts, astrology, Bigfoot, and the other occult notions. So much for anti-religious claims of credulity. RW: You theorize that religions belonging to the strict niche with a strong image of God tend to show more growth than lax religions, something that you find has been borne out with the steep declines in mainline Protestantism. How would you respond to critics who point to the recent drops in membership, baptisms, and missionaries among such a conservative group as the Southern Baptists? Stark: The Southern Baptists may currently show a slight decline for a variety of idiosyncratic reasons. But the fact remains that, overall, evangelical (or conservative) Christian groups are growing while the liberals decline. RW: Toward the end of the book, you note that much of research today looks at the effects of religion but is limited to an individual perspective. But such research ignores the social context. What is the advantage of taking the latter route? Stark: Because, under some circumstances the religious climate (or environment) determines whether and how individual religiousness matters. For example, individual religiousness only deters delinquency in communities where the majority participates in organized religion. RW: There is much talk today about religious versus secular conflict, especially along political lines. You write that norms of civility tend to develop between competing religious groups, but can that pattern apply to religious-secular conflict? Stark: The days of conflict and prejudice among Catholics, Protestants, and Jews are behind us in the United States and much of the West—although there is growing anger within and towards Islam. Meanwhile, the secular—or irreligious—community has become increasingly and overtly hostile towards all aspects of religious life. Given that the media strongly support and, perhaps, even promote these attacks on religion (don’t you dare wish anyone a merry Christmas), I see no hope of civility developing here anytime soon. RW: What stands out in reading the book is your frequent use of historical data and examples. Is that because you’ve built up such a storehouse of such material from your historical research, or is there another reason for that approach? Stark: I draw on historical examples because they often are more apt than any current ones—it is a mistake for social scientists to limit themselves to the “church of what’s happening now.” Indeed, so much of my research has been historical precisely because major issues and explanatory opportunities often exist primarily in the past—the rise of Christianity, for example, is a rather more profound phenomenon than the rise of the Southern Baptist Convention.